1. Pick art that YOU love! I think this one can get tricky. There is the idea that things need to match or look perfect together and this was my biggest problem in picking what I wanted to hang. I did want the art to compliment each other because I wasn’t going to hang too many pictures but at the same time I didn’t just want to pick things because they went well together, I wanted to love them. I think there are so many different styles that you want it to reflect YOU the most. This was probably one of my favorite parts about getting most of my art from Minted was the variety they had to choose from. I just love that Minted connects you with so much beautiful art from independent designers all over the world. It sure makes picking out your art easier and there are so many options to choose from. 2. Have it compliment the room. This is something I think is super important! You want it to compliment and go with the decor of the room. Whether it’s in style, colors, frames or matting. I feel like it brings the whole room together. 3. Mixing up frame size and layout. Mixing it up makes it look like a gallery wall. If all the frames are vertical and very similar or the same size it starts to look more uniform. Different sizes add so much interest and at the same time bring everything together. 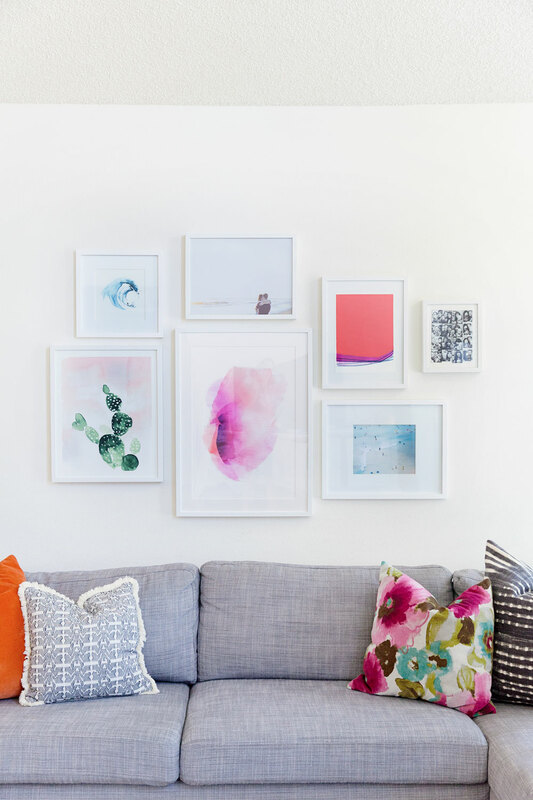 So get crazy with sizing and throw in some vertical and horizontal layouts and your gallery wall will look more cohesive. 4. Give it a personal touch. I think one of the best things about gallery walls are that they reflect the person or family. I love throwing in some photos of my family, trips pictures or a piece of art that has some meaning, it makes it more personal and tells a little bit of a story. 5. Custom Matting. THIS one is huge to me! I feel like every frame has its own standard matting, which is great, but it makes a gallery wall a tad dull when they are all matted the EXACT same way. Change it up! Add some smaller/ thinner mats or some larger ones, or none at all. The variety makes things interesting and sometimes a matt can end up covering up a lot of the art you bought in the first place, which is sad. Custom matting can get expensive so in order to keep things cheap you can make your own! Amy from Homeyohmy shares a great tutorial on making your own matting for frames here. OR I like to hit up Hobby Lobby where I live because their matting prices are pretty cheap and with a 40% off coupon it doesn’t end up costing much at all! 6. Frame placement. This part is the most stressful to me! Ha, I always think, what if I get it all on the wall and it turns out looking awful or I hang it all wrong! I think the best tip out there is to use craft paper to plan everything out first. This was actually the first time I used this technique and I have to say…it does take longer but makes things so much simpler in the long run. You can move and rearrange frames as many times as you want and not make a million holes in the walls. 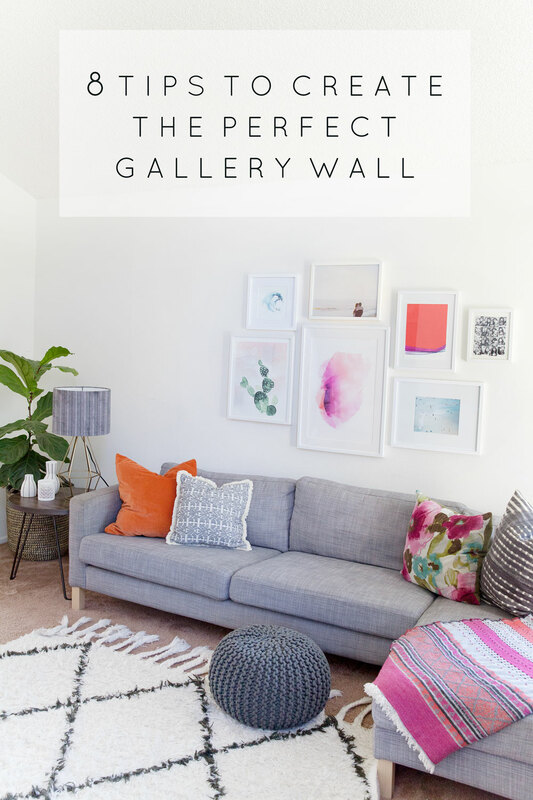 Here is a great tutorial on how to hang your gallery wall. 7. Add one large piece. Emily Henderson, my most favorite decorator, gives this tip and I LOVE it! 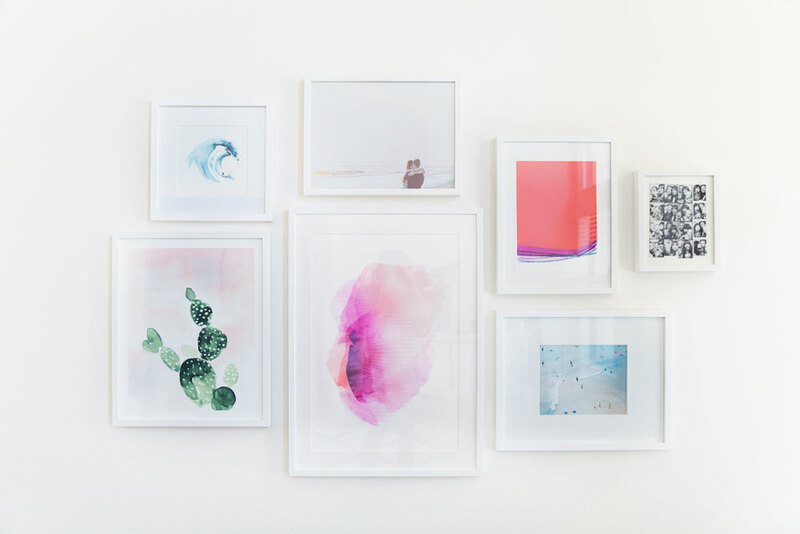 She talks about anchoring your gallery wall with one big piece of art and then adding all the smaller pieces around it. She shows how she did that here. It looks stunning and really gives balance to the wall. 8. Pick a great wall! Gotta end with this one because let’s be honest, if you spend all this time making a fabulous gallery wall with art that you LOVE and inspires you, how sad if its hung on a not so great wall. Pick a wall that is the focal point of the room or where it will really make an impact. Now I am NO expert but these tips and tricks helped me so so much. 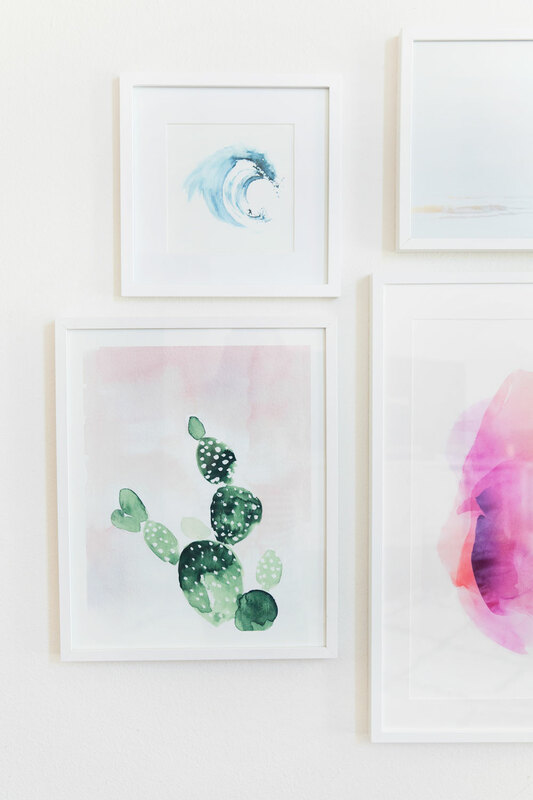 Nothing is an exact rule but I think if you use a few of these tips, your gallery wall will wow and be something you love. Happy Hanging! Great post! And that rug ? ?, where is it from!? I’m moving in two weeks and trying to find one exactly like that! Looks great, thanks for the tips! I used craft paper to plan out my gallery wall and it made everything so much easier. Love your tips! Thanks for sharing. I’ve been wanting to do a gallery wall for some time but finding it a struggle. My gallery is going to feature family photos rather than art I think. Thanks so much for the tips.